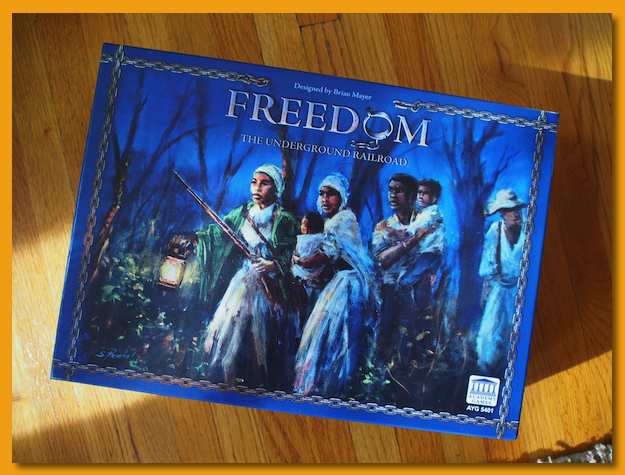 Freedom: The Underground Railroad is a cooperative game for 1-4 players. 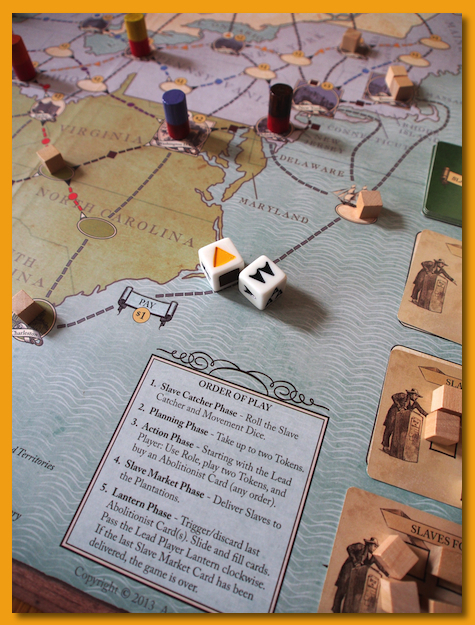 Designed by Brian Mayer for a 2012 release, the game has players select a unique role and participate, as a group, in helping slaves escape through the Underground Railroad. The game has a unique system of movement of “slave catchers” that roam the eastern United States looking for slaves that players are trying to move north to Canada all taking place within a rich historical context. At the beginning of the game, players select a role from one of the characters. They’re not specific historical characters but a type of character that would have played an active role in the Underground Railroad. This character gives each person a unique special ability. 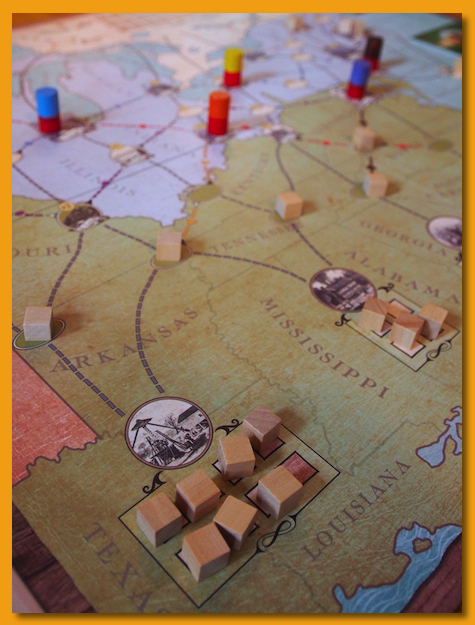 The game lasts a maximum of 8 rounds and within each round, players first roll a pair of dice to determine where the slave catchers move on the large map. If the catchers arrive at a location where slaves are present, they’re captured and sent to the slave markets to return to the plantations. After the catchers move, each player gets a chance to purchase up to two tokens from a selection of three types: support, conductor, and fundraising. 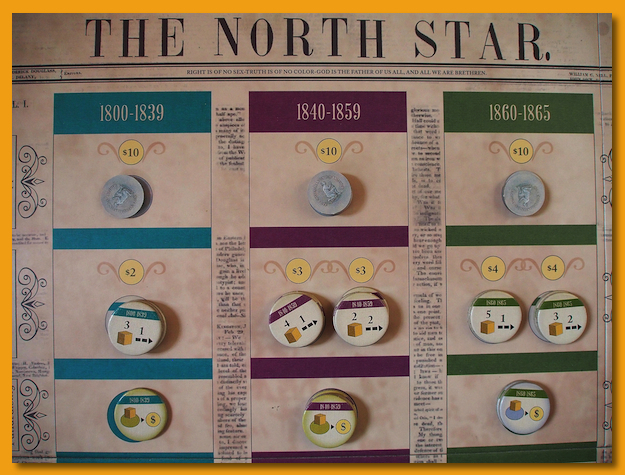 The game features an interesting time movement across the years 1800-1865 split into three periods: 1800-1839, 1840-1859, and 1860-1865. Tokens and cards are placed in each region but the items in the regions aren’t available until the game progresses to that point in time. However, rather than time moving at a regular pace through each round, it’s up to the players to purchase the support tokens in each period to advance the time clock and unlock the next region. The support tokens are very expensive and represent the local political and personal support for the abolitionist movement. You can’t win without purchasing all of them so as a team, you need to obtain the local support. But since they’re so expensive, at times you’ll need to make some sacrifices to spend money in other ways. Money in the game is extremely tight. After purchasing up to two tokens, players then get to perform a actions from a list of available options. The purchased tokens let players move slaves out of the plantations and from one city to the next across the map. However, as they move, they trigger the slave catcher movements towards moving slaves. 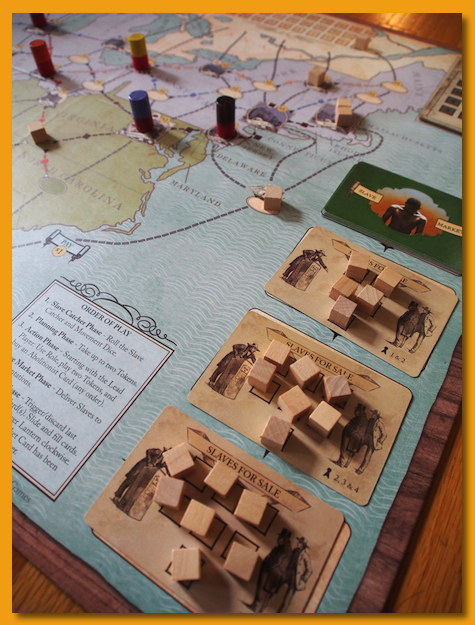 Sites for slaves are limited but another prerequisite for winning is that you must move a specific number of slaves safely to Canada (the exact number changes depending on the number of players). To make it difficult (and sometimes seemingly impossible) slaves have to move out of the way of the plantations leaving openings for other slaves to escape but doing so may (most definitely will) trigger the slave catchers to catch somebody. At the end of each round, a new group of slaves from the slave market must be assigned to the plantations and if you don’t have enough room to house them (because you didn’t move enough out onto the map in the previous turn), the remaining slaves are “lost”. Lose too many and you’ll lose the game. When the slave catchers catch slaves, they are assigned to the slave markets so they aren’t immediately lost but the captured slaves will come back onto the board at one of the southern plantations (if there is room) in hopes of having another chance at freedom. At the very end of the round, some cards in a queue of “Abolitionist Cards” are discarded and new cards come out from the deck assigned to the period of time you’re currently playing. Players can buy & resolve one card per round which gives an immediately ability or an ability that can be saved for later. However, there are also, “bad” cards that sometimes trigger negative things when they’re purchased or removed from the queue (e.g. you must return one support token to the board) or trigger a bad situation as long as they’re present in the queue (e.g. support tokens cost more than normal). I really like the game and find it very challenging. The theme is outstanding and play is a bit puzzly trying to figure out how best to play cat-and-mouse with the slave catchers drawing them back and forth across the map as slaves move north. As I said, money is very tight. You need it to purchase tokens to move slaves and cards to take advantage of their actions but you so badly need it to purchase support tokens. 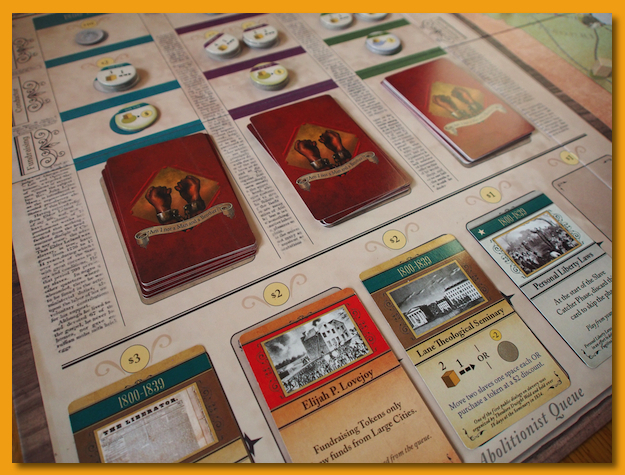 The team has to manage many aspects of the historical context to pull out a win, the cards in the Abolitionists Queue providing real historical events and people to the theme, so discussion of what people will do on their turn is strongly encouraged (and is definitely going to be necessary).